The Rexel Mercury RDX2070 Cross-Cut Shredder is a large office shredder capable of shredding up to 21 sheets of 70gsm paper (or 20 sheets of 80gsm) at a time. An induction motor helps to keep the noise level down (handy for a shared work environment) and the shredder has a P-3 security rating, shredding each A4 sheet of paper into approximately 200 cross-cut pieces measuring 4 x 45mm. 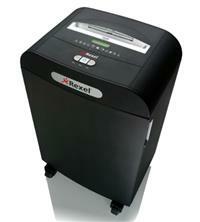 This size of particle means it is suitable for the shredding of confidential documents. As well as paper, this shredder will also shred staples, paper clips, credit cards and CDs - ideal if you don’t want to have to prep documents before shredding, and you also want to shred a variety of different media types. Bin capacity is a very large 70 litres and this means you will be able to shred approximately 850 sheets before you need to empty it. When you do, you simply open the front of the shredder to gain access to the pull out bin. Recyclable bags can also be used with the shredder. Other features of the Rexel RDX2070 include: 250mm entry width; handy jam-free technology; an auto oiling system (you just need to change the oil when prompted); and easy to use controls. Warranty on this machine is 2 years. So, if you are looking for a large departmental shredder (recommended for up to 20 users), suited to high volume shredding of confidential material, then consider the Rexel Mercury RDX2070 Cross-Cut Shredder.